Every year (or most years? some years) we have a thread about various inappropriate Halloween costumes. I thought it would be a good time to open a thread for general discussion, since we're nearing Halloween and because in the last week I saw two related things I wanted to share. 1. The Evolution of Halloween Costumes, From Girls to Women, which shows the differences in what costume-makers imagine a female person should look like as a nurse, bee, cat, etc. when a little girl, a tween, a teen, and an adult woman. It's one of those things we all know intuitively, but it's fascinating to see it put together like that. 2. Over the weekend, I watched the Halloween episode of Chopped, a cooking competition show on the Food Network, which originally aired in the US last Tuesday. 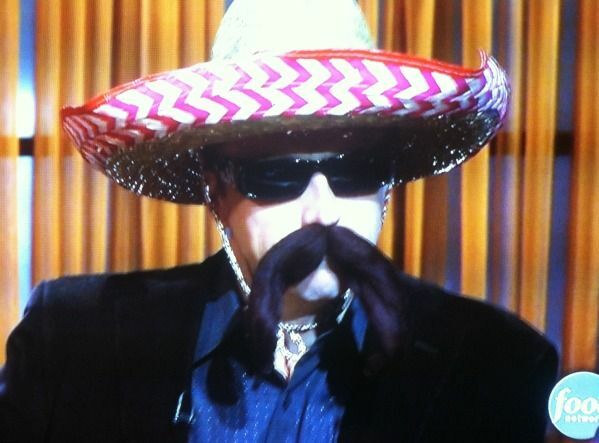 In the opening segment of the show, the three judges were wearing costumes, and Chef Marc Murphy's costume, such as it was, was "Mexican." I took this picture and sent it to Deeks, who also loves Chopped and was appropriately contemptuous with me. We chatted about it on Twitter a bit at the weekend, too, where Amadi joined in our disdainful snarling. It is incredible (if unsurprising) to me that in the year of our lord Jesus Jones two thousand and twelve there are still people who think that wearing stereotypical markers of another ethnicity is a "costume." I hope Chef Aarón Sanchez gives Murphy an earful of whatfor next time they judge together. ANYWAY! Have you seen any objectionable/inappropriate/contemptible costumes so far this year? What are your least favorite class(es) of costumes generally? Ever wear a costume you now regret? Do you have trouble finding prefab costumes for your kids that aren't terrible? Discuss.